→How To Wire LED Light Without Relay? Correct amount of current, voltage and resistance are necessary to be followed in case of wiring LED lights in order to maintain the circuit. Due to such level of accuracy to be followed, it gets difficult to wire LED lights. In case of wiring LED lights, relay is an important system that is followed. It is required in controlling the electricity in a high-current circuit load respectively. However, relay is avoided in certain cases and alternatives like switches and circuits are used in its place. Proper ideas regarding wiring LED lights without relay are effective in carrying out the task. A relay provides low current circuit to control the electric flow in high current one. Overheating of the switch may sometimes occur in cases where a relay is not used and only a switch is adopted. It can lead to dangerous situations. So using a relay is safe in such instances. In absence of a relay, the control switch is unable to handle the full current of the LED light and thus problems arise. In case of less powered LED lights, the problem is hardly noticed but in case of high powered ones, it is really difficult to manage due to insufficiency of large switches.As a result, difficulties like melted wires and heating of the switch more than the optimum level occurs. Without a relay, full current of the LED light is not managed and the light is feeble. Bright light is only possible through relay. For this reason, relay is preferred to be used in LED lights. Relay parts are exposed to extreme wearing and tearing and may cause ignition of sparks between the switch contacts. The sparks are noticed when the voltage and current levels are higher than optimum level. They are of no use in micro-electronic circuits due to absence of high current. As a result, additional circuitry is required in their cases. The coil can be damaged due to the back-emf created during powering off the relay coil. They show a fairly slower response. Due to slow type of response, they cannot be used to turn the switch on and off at rapid speed. This is a major drawback in case of relay. In such cases, relays are to be avoided to be used in wiring LED lights respectively. 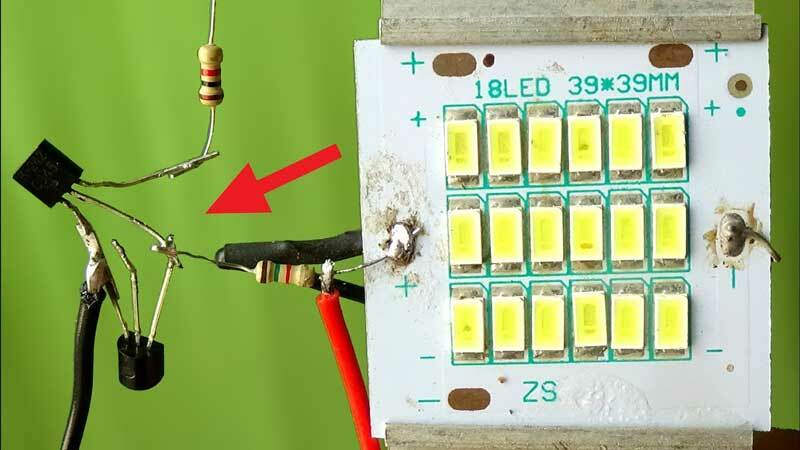 The following steps will guide you to wire LED lights without relay. Read carefully and follow accordingly. Light Emitting Diodes or LEDs can be chosen based on their color temperatures and operating life. LED should be selected with those containing a higher color temperature than the lower color ones as they prove to be more efficient than the later ones. A color temperature of around 2700K to 3000K would be appropriate for using respectively. They can also be chosen on the basis of their operating life which varies within 20,000 to 50,000 hours. There are different options to choose from nowadays due to more advanced production of variations of LEDs to choose from. After selection of the LED that is to be used for wiring, the power supply should be selected. The power supply should be such that it has a wattage and voltage appropriate using for the LED. In order to have the current sufficient enough, select all the LEDs having the voltage and amperage of same values. This will not be too complicating and would be easy to carry out as well. While wiring the LEDs, the first and foremost criteria should be to select a power supply more than the total supplied voltage. In this case, the LED should be wired in parallel circuits. Series circuit can be also selected in case of less number of LEDs. Suppose, using a 10-volt power source with an LED rated at 4.1 volts and 10 milliamps (0.01amp) results in a resistor value of 590 ohms. Purchase a resistor with a value close to this making it an approximate score. In this step, the most important task is to correctly calculate the voltage and amperage before determining the resistor. High current value can cause hazards and may cause the LED to explode. So safety must be ensured. Next, the resistor needs to be soldered to the anode of the LED respectively. Turn the switch to the ‘off ’position to avoid any mishaps. Link the other side of the respective resistor to one terminal of the switch using copper wire. Complete the step by soldering the copper wire to both the switch and the resistor. Start soldering a piece of wire between the other terminal of the switch and the positive side of the power supply. Mark this side of the power supply with a "+" which will be a red terminal respectively. Introduce a third piece of wire between the cathode of the LED and power supply. End this step by soldering the wire to the LED and the power supply. The most important step is to properly place the anode and cathode to ensure bright lighting. Turn the switch to the ‘on’ position and check if the LED lights up or not. Also ensure if the light emitting is bright enough or not and you’re good to go. Bringing it to the end, it can be said that wiring an LED should be done with proper steps to be followed safely and appropriately. Although relay is a vital part to wire LED, it is possible to wire one without it. In this case, a switch can be used by determining the type of LED, power supply and resistor and wiring it. This way, the purpose of wiring an LED can be served easily and this process will not require the involvement of a relay as well.